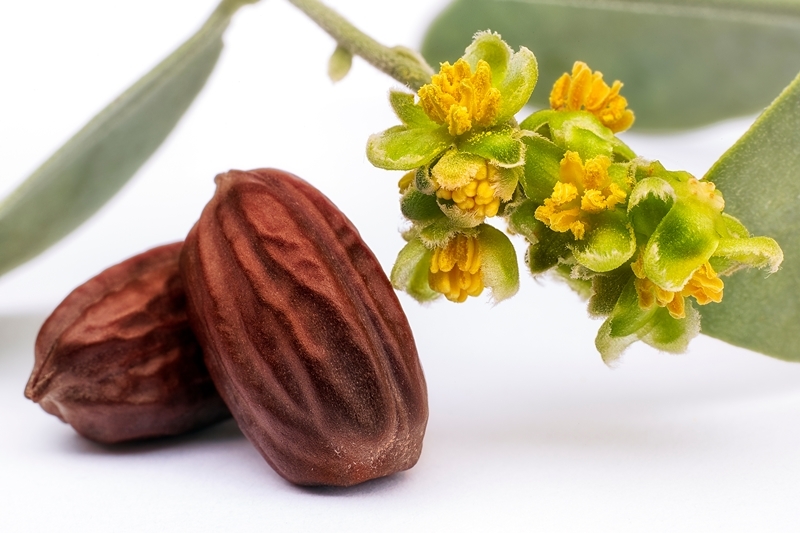 Why is jojoba oil so sought after when it comes to skin care and beauty? When we were formulating our anti-aging Radiance, we knew we had to include the wonderful qualities of jojoba as well as pomegranate extract to boost the inherent skin-enhancing properties of pure baobab oil. Here’s why. Jojoba (pronounced Ho-HO-ba) is an oil pressed from the seeds of the jojoba plant, a shrub growing in the southwest region of North America. The seeds are rich in oil – technically better described as a plant wax – which has been in use for thousands of years. For one thing, Jojoba’s composition is uncannily similar in consistency to sebum – our body’s natural oils that seal in moisture and protect our skin from damage. It’s a substance our skin recognises, making it easily absorbed. In fact, some of the compounds found in jojoba oil are almost instantly absorbed into the skin, where they form a protective shield around the skin cells, preventing them from losing any additional moisture. Secondly, jojoba oil is de-aging. It’s rich in natural Vitamin E and other antioxidant compounds which can increase skin elasticity and reduce the appearance of fine lines and wrinkles, resulting in a youthful glow to your skin regardless of your age. To complete our formulation we also added a blend of pure essential oils which have their own skin-enriching properties and together create a warm yet light and delicate feminine fragrance. You’ll notice that in a very short time, Radiance helps to enhance your skin, giving it the soft, dewy glow of beautiful radiant skin.